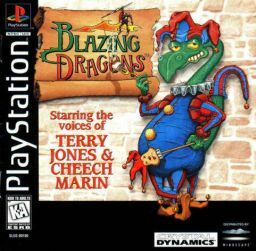 Blazing Dragons is a game that is based on a popular British animated series created by Terry Jones (of Monty Python fame). The protagonist is Flicker, a young dragon who wishes to become a knight so he can marry Princess Flame and become the new king. To do so he enters the dragon tournament. In the process he also foils a human plot to take over the dragon kingdom.